For other uses, see Inshallah (disambiguation). ʾIn shāʾ Allāh (Arabic: إن شاء الله‎, ʾin shāʾa llāhu; pronounced [ʔɪn ʃaːʔɑ ɫˈɫɑːh]), also inshallah, in sha Allah or insha'Allah, is the Arabic language expression for "God willing" or "if God wills". The phrase comes from a Quranic command which commands Muslims to use it when speaking of future events. 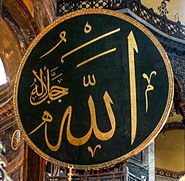 [Quran 18:24] The phrase is commonly used by Muslims, Arab Christians, and Arabic-speakers of other religions to refer to events that one hopes will happen in the future. It expresses the belief that nothing happens unless God wills it and that his will supersedes all human will. A similar expression exists in Maltese: jekk Alla jrid (if God wills it). Maltese is descended from Siculo-Arabic, the Arabic dialect that developed in Sicily and later in Malta between the end of the 9th century and the end of the 12th century. In the Spanish and Portuguese languages the expressions ojalá (Spanish) and oxalá (Portuguese) come from the Arabic expression ʾin shāʾa llāh. In Serbo-Croatian, the expression "ako Bog da/ако Бог да" a South Slav expression calqued from Arabic. Owing to Ottoman rule over the Balkans, it is used extensively in the ex-Yugoslav countries of Bosnia and Herzegovina, Serbia, Croatia, Slovenia, North Macedonia, and Montenegro. ^ Rebecca Clifta1; Fadi Helania2. "Language in Society – Inshallah: Religious invocations in Arabic topic transition – Cambridge Journals Online". Journals.cambridge.org. Retrieved 2016-07-07. ^ Abdur Rashid Siddiqui, Qur'anic Keywords: A Reference Guide, Kube Publishing Ltd.
^ a b John L. Esposito, ed. (2014). "Insha Allah". The Oxford Dictionary of Islam. Oxford: Oxford University Press. doi:10.1093/acref/9780195125580.001.0001/acref-9780195125580-e-1041 (inactive 2018-09-04). ^ Anthony Shadid (Jan 11, 2010). "Allah – The Word". At War. New York Times. ^ Azzopardi-Alexander, Marie; Borg, Albert (2013-04-15). Maltese. Routledge. ISBN 9781136855283. ^ "The European Union". Books.google.com. Retrieved 2016-07-07. Look up inshallah in Wiktionary, the free dictionary.